Puzzles & Pastimes - D.C. Thomson & Co. Ltd.
Puzzler Media works with dementia specialists Unforgettable to launch a bespoke magazine to engage, stimulate and occupy people living with dementia and their carers. This pioneering format is specifically designed to engage people living with dementia and help those who continually strive to give their loved ones a better quality of life. Puzzles & Pastimes magazine includes a range of activities to suit those living with dementia – both in early and mid-stages. The specially designed content includes entertaining puzzles, colouring and other activities, alongside nostalgic images and easy recipes designed to stimulate the mind and in turn spark memories and conversations. There’s also a detachable booklet for carers containing practical tips and advice on how to get the most out of the puzzles and other activities that will allow them keep their loved one engaged. In 2017, The Lancet reported that dementia is the greatest global challenge for health and social care in the 21st century: around 50 million people worldwide have dementia and this number is predicted to triple by 2050. Research has shown that the over 50s are now more concerned about developing dementia than getting cancer. Publishing Manager, Mark Whiteway, talks about why Puzzler Media decided to team up with the experts at Unforgettable. “We have over 45 years of experience in making puzzles of all types and levels of difficulty, and we know that our readers value puzzles as a way of exercising mind and memory, as well as for their pure entertainment value. Some readers resort to children’s puzzles as their sight and memory deteriorate, so we wanted to produce a dedicated magazine that would allow solvers to enjoy the benefits of puzzles for as long as possible, whether alone or in the company of a carer. Unforgettable.org was founded by James Ashwell, who, having cared for this mother with dementia for five years, wanted to help others living with the condition. He launched Unforgettable – a world-leading source of life-changing products and services for people with dementia, and set up a charitable foundation. He says, “Our mission is to create a world where people with dementia live the best possible life. People are living longer and family members have high awareness of needs so are actively seeking products to help give a better quality of life to their loved ones. 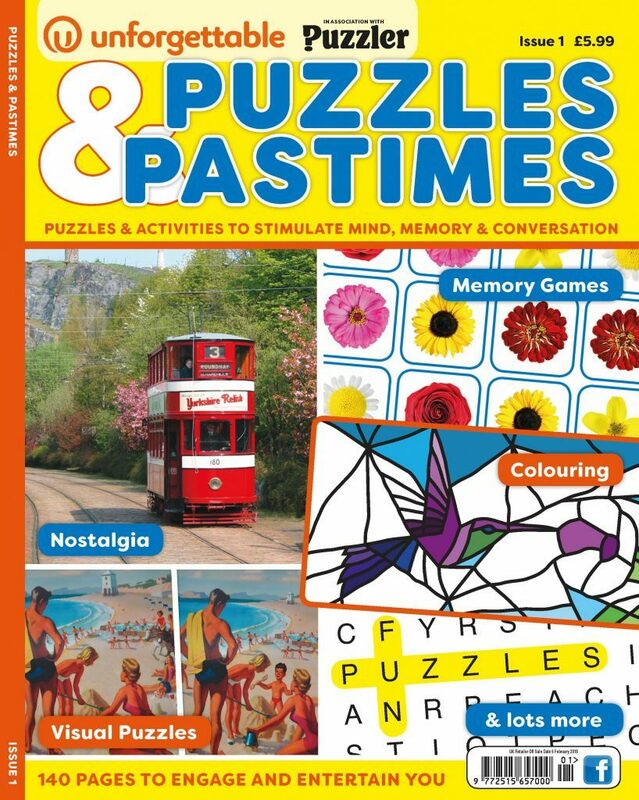 PUZZLES & PASTIMES is available from: WHSmith, Tesco, Sainsbury’s and all good newsagents.